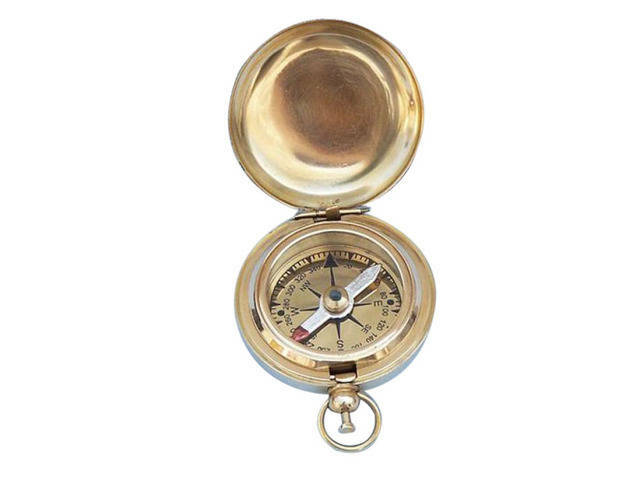 Solid Brass Scout's Push Button Compass 2"
The Hampton Nautical Solid Brass Scout's Push Button Compass 2" has a polished mirror-like shine and is a great companion for the true navigator. This antique compass looks just like a 100-year-old antique but has a shiny and brand new feel. With a brass trim and a smaller face, it also features a push button connected to a ring that when pushed will pop open the compass and reveal a shiny mirror-like back lid. For it to work, a marine compass needs two things: a small, lightweight magnet, and an almost frictionless point to pivot on. The Chinese solved this initially by simply attaching a needle to a silk thread, or floating it on a piece of cork in a bowl of water. However, in order for the needle to point North or South it first needs to be magnetized. This was accomplished by rubbing the needle across a piece of hematite, or lodestone, which is a naturally occurring magnetized mineral. With the needle now reacting to the Earth’s magnetic field, it would point to one of the poles, and the marine compass now operated. To understand how these brass pocket compasses work it first needs to be understood how magnetism works. Everything in the universe is made up of atoms, which are in turn made up of a nucleus comprised of protons and neutrons, with electrons orbiting around it. An electron is like a tiny bar magnet in that a rotating electrically charged particle creates a magnetic field, with magnetic poles, in what is called an orbital magnetic dipole moment. However, as the electrons physically pair up so that they are spinning in opposite directions, the net magnetic charge for the particle is zero. In creating a magnet such as a needle, by rubbing it on a piece of lodestone, the magnetic properties of the lodestone cause these rotating electrons to align their movements and spin in the same direction. This matching spin creates a flow from positive to negative, much like the flow of an electric current, and the needle is magnetized. By attaching this needle to a small pivot, with a set of cardinal directions fastened underneath it, the marine compass was born. Each of these marine compasses for sale operates on this unchanged and very simplistic principle, yet this basic tool was powerful enough to revolutionize navigation, sailing, and the exploration of the world.